Finally you have managed to control the pimples on your face. But the problem does not end there. Now you have to deal with the scars left by the pimples. Removing these scars can be very difficult and frustrating. You can wait for them to naturally disappear or you can pay for pricey treatments that can get rid of them fast. It’s good news to know that there are cheap ways to remove those pimples effectively. To help you with this problem, here are some useful tips. Your skin loses its elasticity when a scar is brought about by pimples. The main thing for you to do is to regain the elasticity by increasing the level of collagen. You can do this by the kinds of food and beverage you eat and drink. You need to drink plenty of water, as this will help in making your skin more elastic. Make sure you east plenty of fruits and vegetables as well, as this will increase collagen in your skin and hasten the recovery from the scarring. It is very helpful to use cucumbers and tomatoes on your skin. Doing so will help in the process of healing. All you need to do is slice a cucumber or tomato and put it on your face—specifically the affected area—and leave it there for about 10 minutes. There are properties in the tomato that can help break down the toughness the scar brought out. Cucumbers, however, have a cooling and refreshing effect on the skin and will help tighten the pores. These natural remedies can help you in repairing your pimple scars. Another step in successfully fading these pimple scars is for you to remove the old skin that is damaged. Our bodies have natural ways of healing scars, but the process can take a long time. It may take years before a severe scars is completely healed, and it will depend on the level of damage and skin scarring. If you plan to have it quickly removed and if you have the money, you can consult with a certified dermatologist and she will know what to do. There are different ways to remove your scars. You dermatologist can prescribe a topical cream for you or could suggest a treatment like dermabrasion to help you fade your scars. A process called Microdermabrasion is effective. This is the process of removing the top layer of your skin—specifically the area where the scarring is—to reveal a new layer of skin. Substances are gently rubbed on your skin to exfoliate the dead skin layers. This process can be achieved at home. All you need is to mix baking soda with water until you form a paste. Rub it on the scarred area for about 30 seconds. Make sure you rub in gentle and circular motions. Once you are done, rinse your face with water and pat your skin dry. You can do this treatment for alternating days for a few weeks. 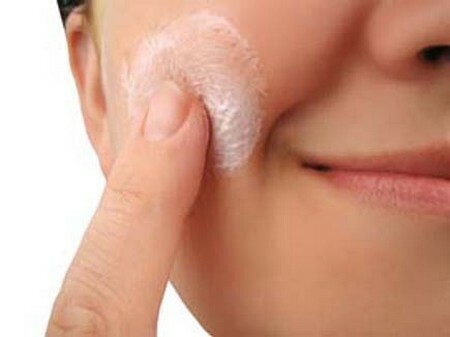 Baking soda has a bleaching property that can fade away scars, and its powder-like consistency can scrub away dead skin. This will improve the appearance of your skin, making it evenly toned and smooth. It is an easy and cheap treatment that can bring results like that of a pricey Microdermabrasion procedure.